Boba Fett remains a major player in the Star Wars universe, even after suffering a truly embarrassing death. But did he really die? Well, that was the original plan, but the character became so popular after ESB and ROTJ, that later books and stories resurrected him. 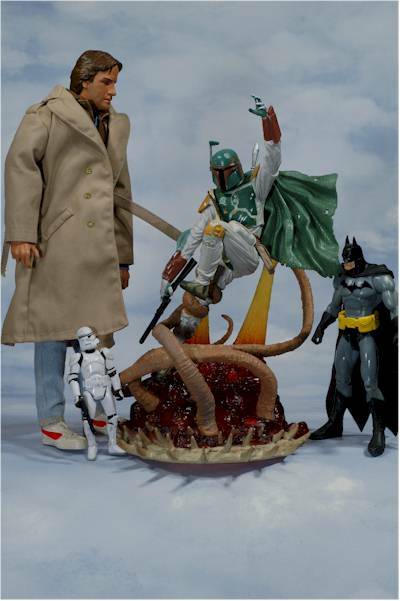 Rather than die at the hands, uh, tentacles of the Sarlacc, the Expanded Universe explains that he actually escaped the Sarlacc, and went on to hunt some bounty, and I'd presume booty, again. Hasbro's Unleashed series of plastic statues has had some ups and downs along the way, but has been overall well received. This latest addition to the series - along with a new Grievious - is a Target exclusive, and started showing up last week. Expect to pay about $20. This is damn cool packaging, and much better than the usual cardback/bubble stuff used with the regular release Unleashed figures. Here you get a large tube - very large. There's a great cardboard insert in the back, showing Boba in the fight for his life, and some appropriate text and additional graphics around the top and bottom. It shows off the statue well, in a style that is very much like a glass case. It's also somewhat collector friendly, and you can pull out Fett just by snipping a couple pieces of tape, and untying a couple twisties. I'll cover the more technical aspects of the sculpt here - the more artistic design issues I'll cover in a later category. The detail work on this statue is excellent, particularly for this price point and this material. It's very much like a mini-Kotobukiya, and the density and quality of materials also reminds me of their Star Wars work. There's lots of small detail work, and the wrinkles, textures and folds are all natural and realistic. Scale is a bit wonky of course, since the Sarlacc was much, much bigger than this in the film, but it's forgivable considering their need to conserve space and plastic. 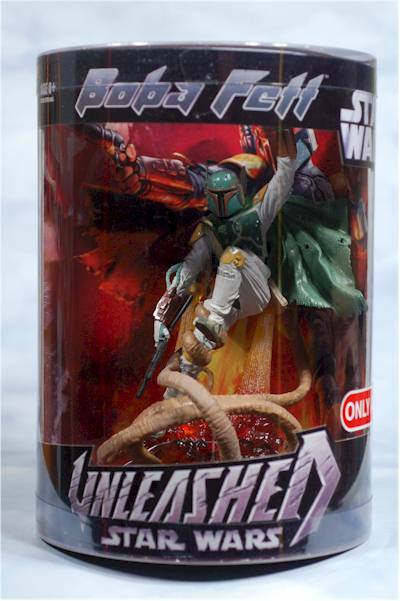 However, I don't see ANY difference in this sculpt and the original Unleashed Fett. I couldn't compare them side by side, but I don't think there are any differences. All the paint is very clean and neat, similar to most past Unleashed releases. It's clear that Hasbro puts extra effort and QC into this line and it shows. No bleed, very little slop, a nice wide range of colors, and a little extra care. But while the quality is good, the coolest thing about this figure and it's paint is the lack of it on the base. Rather than paint the rocket fire that's turning the Sarlacc into a roasted marshmallow, they've cast it in a translucent yellow, red and orange plastic. Come up with a cool way to light this guy from underneath and you have a very sharp looking display. Once again though, I can't find any differences in paint with this figure from the original. There might be some subtle color differences, but Hell, I'm color blind anyway. This is really a plastic statue, so I wasn't expecting any articulation. However, you do get a couple basic points. There's a cut neck, and a cut right bicep. You can turn his head from the front to a side position, and the arm turns slightly. Neither of these are particularly useful, and the tentacles are not bendy, something that would have been a big plus. As a plastic statue, I didn't expect any 'accessories', so this score relates very little to my final score. Still, it's worth noting that his blaster is removable, and comes rubber banded into his hand. When you're dealing with a statue, something like this is less 'accessory' and more 'crap that falls off every time you move it'. Since this is a statue more than an action figure, the design of the pose and style are critical to it's overall appearance. And here we have some good - and some bad. My favorite aspect of the design is the aforementioned clear flames. 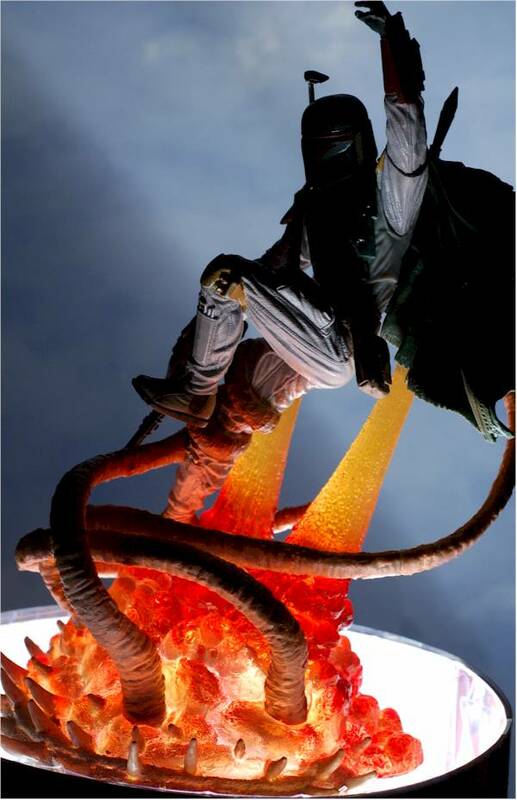 These are designed to appear as though Fett is attempting to blast his way free using the rockets, and the flames are rolling up from where they are contacting the beast. It's a great look, and really works well. 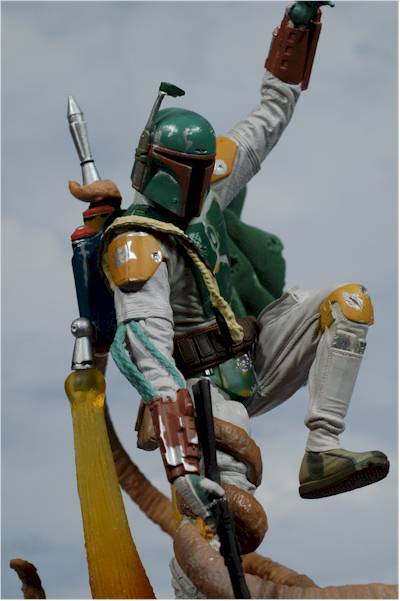 However, there's something about the actual pose of Boba that just doesn't feel right. While I understand the raised left arm and leg are an attempt to keep the Sarlacc from grabbing them, it looks a bit convoluted. 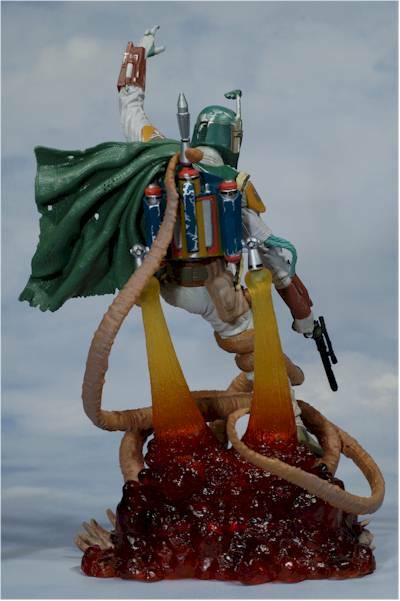 I think this is because part of the statue looks like Fett is falling - the pose of his arms, legs and cape - while other parts appear as though he's rising. I think this mix and match approach to the design is causing my little brain to get confused, creating a low level negative reaction to the appearance. To get what I'm saying, look at the flow of the cape, pose of the arms and legs, and the design of the tentacles and flames, and then tell me - is he rising or falling at this instant? My other issue is that this particularly moment in his history, while cool when taken out of context, is preceded by mere moments with his most embarrassing. I can't quite separate the two, reducing my enjoyment of the design in general. You may not have these issues, and may find that the lines and flow of the piece work great for you. It is art, after all. These aren't really designed as toys, or even designed for basic posing by adult collectors. You buy him, you take him out of the box and stick him on the shelf, and you admire him. Another factor that in this case will have little weight on my overall score. Regular Unleashed figures go for $15, but since this is an exclusive (and comes in a nifty box to prove it), I'm not too surprised it costs a little more. Still, this is a bigger increase than I'd expect, and bigger than what really feels appropriate. As far as I can tell, you're paying an extra five bucks for a plastic tube instead of a cardback/bubble package. And that sure doesn't feel right to me. Not much. Paint ops seemed pretty consistent with all the ones I've seen, so it looks like there are few worries. I've only picked up a handful of the Unleashed figures, largely because I didn't need one more Star Wars line to complete. 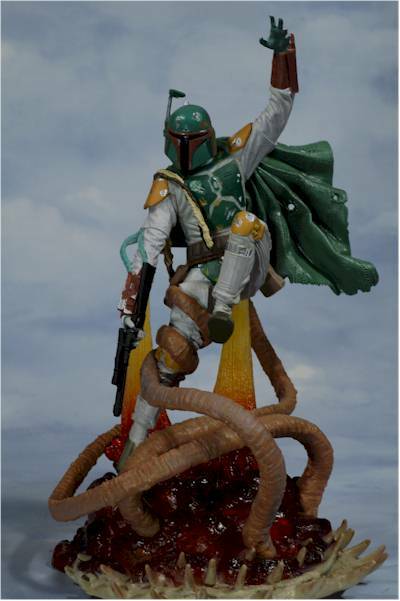 There have been some very nice ones, and as a big fan of Fett, I think they did a solid job with this one. It's not my favorite representation of the character, but it's better than some poses I've seen selected by companies producing much higher end - and much more expensive - statues and busts. 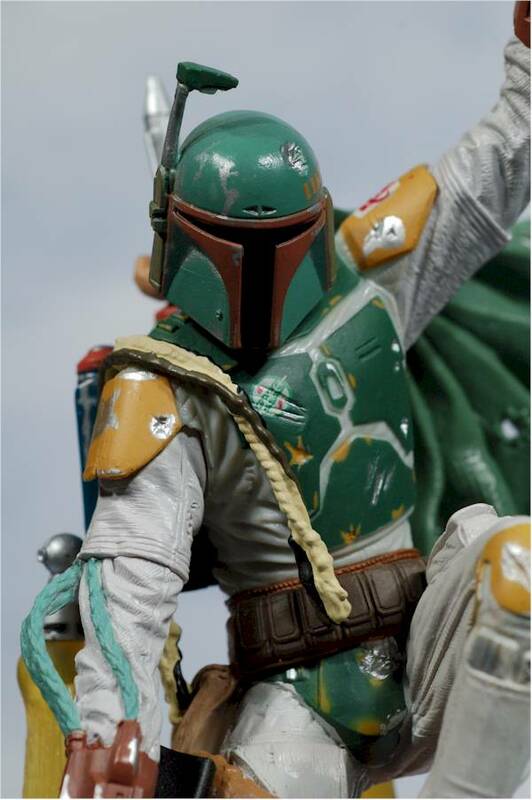 With this level of quality, I'm sure plenty of Star Wars fans will be quite happy with this version of Fett. The issues I do have are largely ones of personal taste, and if you are happy with the general design and pose, I'm betting your own overall score would be another half star higher at least. That is, unless you already bought this guy the first time around. While my personal issues with the design bring the overall score down a little, it's the simple fact that you'll end up paying $5 more for what is really a re-issue of a figure you may or may not of already bought. A figure like this is already practically like printing money - charging more for it is just akin to twisting the knife. Target is the place to pick him up, since he's an exclusive. 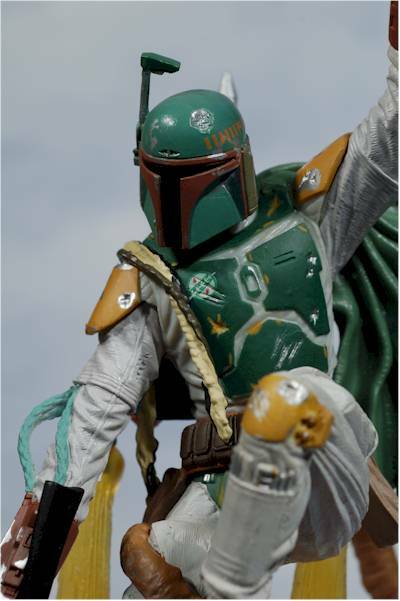 - My favorite Fett in my collection is the one from Marmit, reviewed here by DanB. - and let's not forget the Titanium edition, with the first removable mask.